On Sunday after work we hung around and waited for the Super Bowl to start. We only wanted to watch the commercials and the half time show. I enjoy a good Super Bowl party and have attended a couple of great ones at my sister-in-laws but this year with work and the fact that the Pats weren’t in it, Mary and I decided to skip it. My sister decided that we all needed to see the commercials in 3d so she picked up some glasses. I think she thought that she could see better with more than one…..but four? Seriously – how much do you think your forehead could see? She shared with us later – not that it made any difference – they weren’t great. Neither was the halftime show – just what I always wanted to see – the Boss’ crotch sliding into the camera….nice… So for me a bust of a Super Bowl – how was yours? This weekend Jared and Kyle (Kat's son) came to camp. 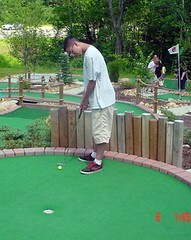 On Sunday, Mary, Kathy and the boys went mini golfing at Chucksters in Chichester, NH. They had a great time. Everyone won and then they got ice cream. Kyle had green (his mother's favorite color) Upchuck ice cream MMMMMMMMMM good. It was lots of fun and they want to go back another time.